AMES, Iowa — Loss of habitat containing milkweed plants is considered a leading cause of the precipitous decline in monarch butterfly populations over the past 20 years. To reverse loss of this iconic species, recovery plans nationally have ambitious goals for new habitat. Iowa, in the center of the monarch’s summer breeding range, has a goal to establish hundreds of millions of new milkweed stems across 480,000 to 830,000 acres, by 2038. Monarchs lay their tiny, off-white eggs only on milkweed, and eggs that hatch into hungry caterpillars also feed solely on milkweed leaves (though adult monarchs feed on nectar from a variety of flowers). There are hundreds of species of milkweed, over a dozen native to Iowa. But are they all equal when it comes to supporting monarch recovery? New research by Iowa State University scientists suggests they are not, with monarch females showing a preference for certain types of milkweed when laying their eggs. 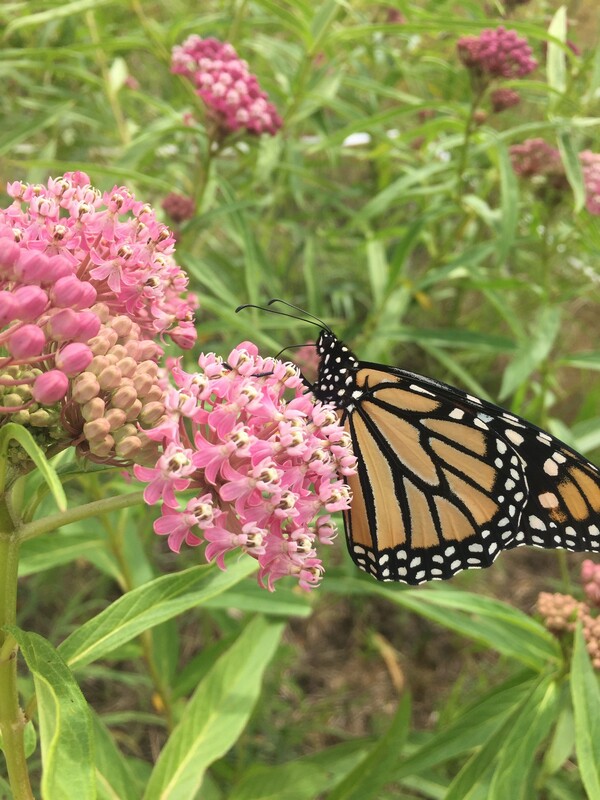 The findings, from a three-year field study at multiple locations across Iowa, were published in the October issue of the peer-reviewed journal Frontiers of Ecology and Evolution, where the article, “Monarch Butterflies Show Differential Utilization of Nine Midwestern Milkweed Species,” is online at https://www.frontiersin.org/journals/ecology-and-evolution/search?query=Pocius#all. Victoria Pocius [pronounced Poe-shus] led the study as part of her doctoral research in ecology and evolutionary biology at Iowa State. She is now continuing research on monarch behavior and physiology as a postdoctoral scientist at Pennsylvania State University. “This research was important to help understand whether what we’re planting will make good use of the time, energy and money that private and public partners are investing in restoration of milkweed habitat,” said John Pleasants, adjunct associate professor in the Department of Ecology, Evolution and Organismal Biology, an adviser for Pocius and a coauthor on the article featured in Frontiers. Other researchers on the study team were Steven Bradbury, professor of natural resource ecology and management at Iowa State; Sue Blodgett, chair of the departments of entomology and natural resources, ecology and management at Iowa State; Diane Debinski, head of the Department of Ecology at Montana State University, formerly with Iowa State; Richard Helmich, research entomologist with the Corn Insects and Crop Genetics Research Unit of the USDA Agricultural Research Service and an affiliate professor of entomology at Iowa State; and Keith Bidne, biological science research technician with the USDA Agricultural Research Service. 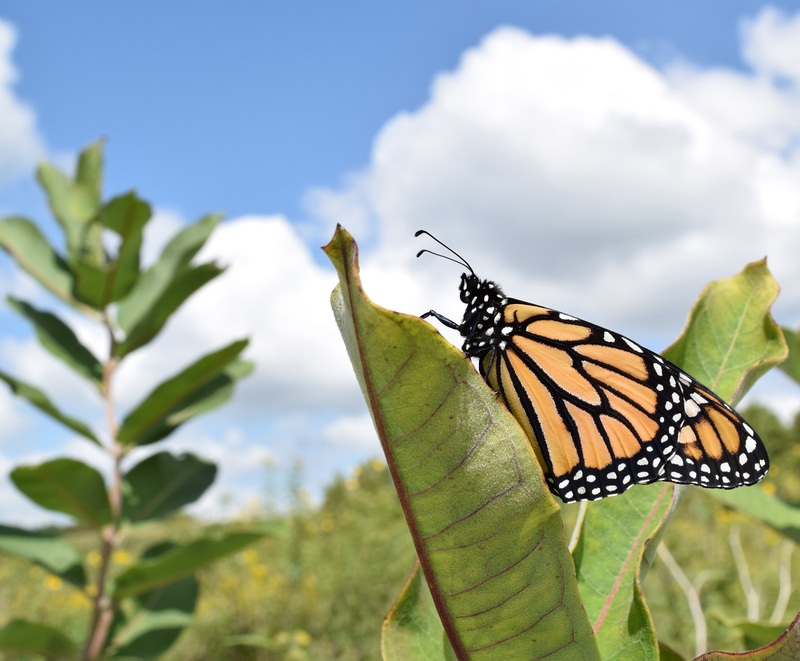 Results from previously published laboratory research conducted by Pocius and other researchers found that monarchs prefer to lay eggs on two Iowa species, commonly known as swamp milkweed and common milkweed. Swamp milkweed is usually found in wetter habitats. Common milkweed grows in diverse conditions and spreads easily through root-like stems. “We needed to see if monarchs’ behavior in Iowa field conditions reflected our lab findings,” said Pocius. The field study took place from 2015 to 2017, during which nine native milkweed species were established in 14 plots across Iowa on public land including Iowa State research farms and on private land. The study results showed that, as in the lab, monarchs preferred to lay eggs on common milkweed and swamp milkweed, but they used all nine species. The researchers ranked the monarch’s use of different species and offered restoration recommendations based on monarch’s apparent preferences and other factors linked to habitats and ease of propagation. While the monarchs laid significantly fewer eggs on the orange-blooming butterfly milkweed, this species is still valuable as a late-season plant host since it maintains its leaves throughout the summer, offering food for monarch offspring when other milkweeds have declined. Also, butterfly milkweed is relatively easy to establish and does not spread easily, making it potentially more popular with gardeners and farmers. The researchers found that other milkweed species may be less effective as hosts for monarchs for reasons such as plant structure. For example, whorled milkweed is spindly and may not easily support butterflies trying to lay eggs. The team learned much about growing and propagating milkweeds, providing helpful take-away lessons for those who want to help expand monarch populations. The research was supported by USDA National Institute of Food and Agriculture Hatch Act funds and a USDA Natural Resources Conservation Service Conservation Innovation Grant. It also received funding from Prairie Biotics, Inc., and the University of Iowa Center for Global and Regional Climate Research. Iowa State University Research and Demonstration Farms, Luther College in Decorah and Central College in Pella provided support and hosted research plots. The Iowa Monarch Conservation Strategy, along with monarch conservation plans created by other states, will be used by the United States Fish and Wildlife Service to determine if voluntary conservation efforts are sufficient to avoid listing the species as threatened or endangered. The Iowa Monarch Conservation Consortium formed in 2015 with a goal of promoting monarch breeding and survival in Iowa. The consortium is a group of 50 organizations, including agricultural and conservation associations, agribusiness and utility companies, universities and county, state and federal agencies. Information about the consortium, how to support monarch conservation and links to research is available at www.iowamonarchs.info. Monarch on common milkweed. Photo by Iowa Monarch Conservation Consortium. Monarch on swamp milkweed. Photo by Iowa Monarch Conservation Consortium.